Will leg leader Groupama 4 (Franck Cammas/FRA) cling onto the lead or will the French lose the precious gains made over the last 15 days? The fleet is converging and the French team’s lead has been up and down like a yoyo for much of today, dropping to a frightening 53 nautical miles at 1000 UTC, before steadily climbing to a healthy 83.7 nm over PUMA Ocean Racing powered by BERG at 1600 this afternoon. However, at 1900 UTC tonight the good news story continued and Groupama 4 was on fire. Her lead had climbed to 92.9 nm over PUMA, and her speed was an astonishing 18.1 knots, when all but PUMA had averaged less than 10 knots in the previous three hours. The five-boat chasing pack had all made losses. 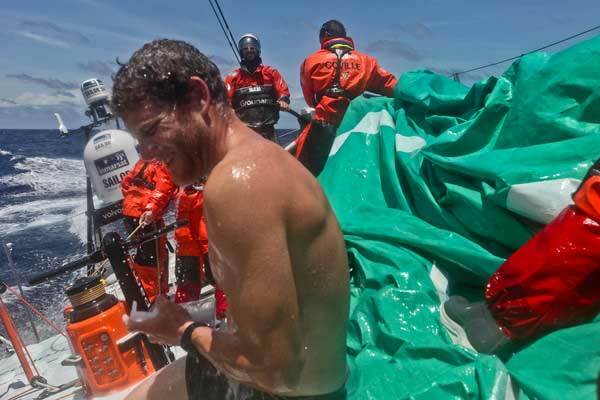 Team Sanya (Mike Sanderson/NZL) was the worst affected, suffering a slamming loss of 34 nm. Abu Dhabi Ocean Racing (Ian Walker/GBR) didn’t fare much better. Engaged in a heated battle with CAMPER with Emirates Team New Zealand (Chris Nicholson/AUS), the Emirati team lost 29 nm, while CAMPER lost 26. Only eight nm separate the pair in distance to finish, but Abu Dhabi has a lateral separation of 163 nm. Telefónica (Iker Martínez/ESP) and CAMPER both put in a series of tacks today to hitch east. Telefónica is now 115 nm west of Groupama, but 153 nm behind in the approach to New Caledonia. The breeze is weakening and there has been some thundercloud activity adding to the intensity on board the six race boats as they sail the last 1200 or so nautical miles to Auckland.